The art of massage was created to treat and soothe muscle and joint pain and to alleviate anxiety. Whether recovering from a physical injury or emotional distress, the healing touch can insure you a speedy comeback. Humans are not the only ones that benefit from a relaxing massage. Your horse, whether a family pet or an award-winning show horse, may be slow to warm up, resistant to work, or have a poor attitude in general. With just one massage session, your horse will begin to show a better disposition and an overall improvement in their well-being. Farriers are often able to detect potential problems during the hoof trimming process, with hoof angle changes, hoof disparities, weight bearing shifts and general comfort of the horse while being asked to stand on 3 limbs while challenging range of motion. Muscles work in pairs: one muscle acts on a joint as the other releases. If the release is not complete for whatever reason, strain occurs in the working muscle, leading to imbalance and movement restraints. Eventually these imbalances can lead to discomfort, behavioral problems, poor performance, and injuries. Often we overlook the importance and effectiveness of an overall rebalancing of the muscle tissue from the horse’s nose to the tip of its tail. 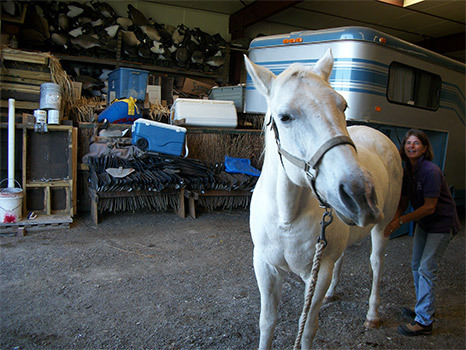 Maintaining your horse’s well-being is part of regular routine horse care. Massage can identify tender spots before they develop into injuries. Muscle manipulation by human hands stretch and relax muscles. Massage can free muscle adhesions and soften scar tissue. Massage improves range of motion. It can restore suppleness and elasticity. Massage therapy can help to flush out toxins that can cause muscle stiffness. Massage can speed recovery from muscle exertion. Athletic endurance and performance can be boosted from massage therapy. It can revitalize your older horse. Massage therapy can help to maintain your horse’s well-being. showing a poor attitude, such as tail-swishing, ear-pinning, teeth grinding, or head-tossing. Carey Miller at Caper Lea Farm has been a certified equine massage therapist since 1997, adding this service for her horse clients. Call today for an appointment at your barn or at Caper Lea Farm.